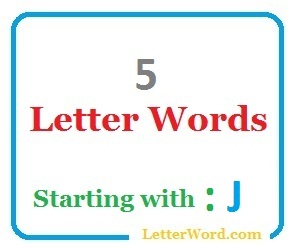 Below is the full list of 5 letter words starting with j in Language called English. 5 letter words starting with j are used to Finding great and easily remember-able domain names and to get good score in scrabble. Despite of all our efforts if you think we have missed any 5 letter words starting with j then do remind us in comments section.